Today I pulled out a cigar I haven’t had in about a year. Once I pulled this one out, I realized how much I missed this one. 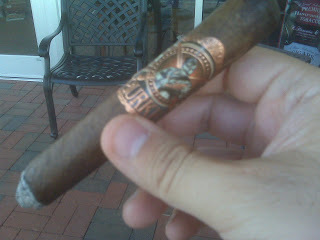 This one was the Gurkha Vintage Shaggy Maduro. With all of the focus around the new IPCPR 2010 releases, I think its good once in a while to pull out an oldie but goodie. The Shaggy gets its name from its frayed a.k.a. “Shaggy” end. These cigars made their debut over four years ago and have probably maintained a steady level of popularity in the cigar community. Gurkha is known for their innovative packaging, but up until the release of the Viper and Ninja in 2010 – this had probably the most simplistic packaging – a wooden box with tobacco leaves surrounding the cigars. 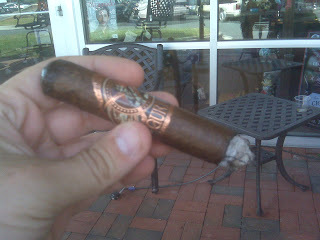 For the purposes of this review, I smoked the Gurkha Vintage Shaggy with the Maduro wrapper in the Toro size. From a taste profile, this is one smooth cigar. I would definitely categorize this as a Medium strength and Medium body cigar. The lighting of this cigar is made easy by the shaggy foot. 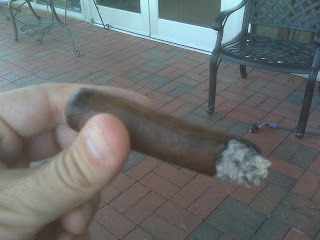 Sometimes with a shaggy foot, the initial draws are very harsh and bitter until the main part of the cigar starts burning. This is not the case with the Gurkha Shaggy Vintage as nice flavors started coming right away. I’ve heard many folks talk about this being a spicy cigar, but I did not really see this here. On the initial draw, there was some pepper and cedar spices, but they receded quickly. Very early I started tasting a coffee flavor. As the smoke started to progress, the coffee flavors got deeper and richer (not stronger though). As you start to progress about 1/3 of the way, there is a deeper chocolate taste that emerges. 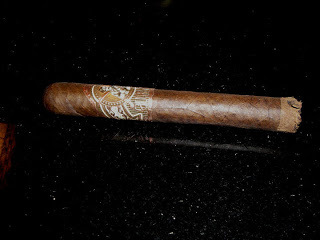 In the second half of this stick, I the chocolate and coffee tones remained, but the richness subsided. Overall, I found this a sweet tasting smoke with no bitter tones. The nice thing about this sweetness was that this did not have the sugary sweetness like an infused cigar. Throughout the smoke the burn was pretty good, although I had to give it a minor touch-up a couple of times. The finish to this cigar was excellent. This was a cool finish with no harshness whatsoever. In fact the sweet tones remained right to the nub. This cigar was really enjoyable. In fact, although this is medium strength and body, I would not hesitate to make this a morning smoke to start. This is one enjoyable cigar from start to finish. Highly recommended. I’m smoking one now. Delicious. Was moist straight out of the wrapper with no humidor time. Lit easy, and is burning true. The smoke is sweet and intoxicatingly delicious. Best of all, this little gem was free thanks to the kind folks at Cigar International.